This place is located in the most populated and noisy area in town. Amongst the hustle and bustle of bhendi bazaar, you can but should not miss this place since this is one of the best places to eat shawarma without digging a deep hole in your pocket. The shawarma starts from INR 60 and is pretty damn filling. 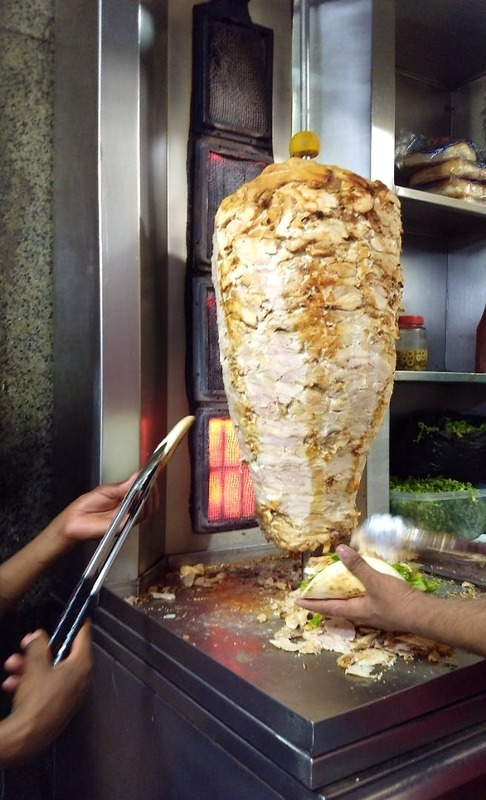 They offer a variety of shawarmas which is difficult to find anywhere in the town. Their extra chicken shawarma with black olives is my absolute favourite. The chicken is cooked to perfection on the rotary grill. It has a nice char on it with a crispy crust and soft creamy centre. The meat is very juicy and tender. The sauces, mayo and the salad in the shawarma has a very nice balance. This is one of the only places in town that uses lettuce and other fresh veggies in shawarma. They have maintained the authenticity of the Lebanese fast food. It's a hole in the wall joint. Though slightly messy to look at, they offer shawarmas gourmet style. It is a must try place for meat lovers. They can definitely work on the cleanliness and it would be great if they add some seating space.